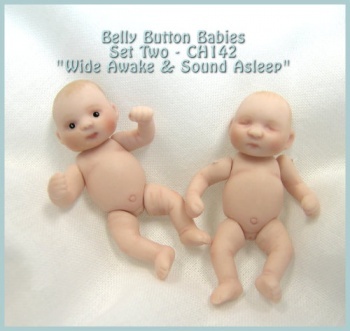 From original sculptures commissioned from Alicia Singleton, Belly Button Babies are the cutest, highly detailed, and expressive little doll ever offered in dollhouse scale. Each doll measure 1 3/4" - perfect size for all your dollhouse nursery furniture. Set includes two heads, one set of limbs and one torso. This set has two darling babies, one open eyed, wide awake, and one close eyed sleepyhead. Note that heads are interchangable between sets. Limbs are sculpted for an exact fit to the torso that they come with, but some limb swapping is also possible for even more poses. Easy to pour, super easy to paint, peg strung. Includes instructions.